With Super Smash Bros. Ultimate on the horizon, a Super Smash Bros. Ultimate Direct tomorrow, I feel it's time I made another Nintendo game thread, this time base on the Super Smash Bros. series, of course. but in case you don't want to think yourself, here's some ideas provided by me. Post predictions for the next Smash/Smash DLC! My personal number one hope is Megumin from KonoSuba, but if I were to be realistic, I would hope for Geno from Super Mario RPG as a fighter, or Black Shadow from F-Zero as an echo. SW-6084-3209-3617 is my Nintendo Switch friend code! 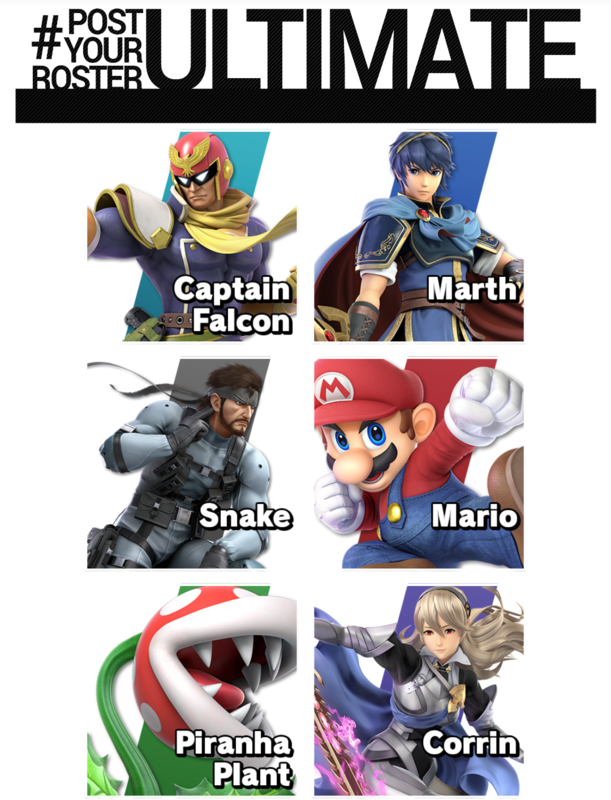 Friend me if you want, but when Smash Ultimate comes out i whoop you all with Falcon, Marth, Snake or Mario. Post your current competitive standing/Global Smash Power/Whatever ranking system they have in ultimate. Post who you main/your character tier list! Read friend code for true mains, but here's a character tier list of mains anyway. Honestly this is the best I could think of doing, BUT I would like to hear other people's thoughts on Ultimate rather than just Bluey and Laur, so uh, yeah post so I can have friends and brag about how competitive I am! Preordered and getting on day 1. Mains right now are Sonic, Corrin, and Link. Hopes: A Fire Emblem character that doesn't use a sword and isn't an echo, a villain rep for Mother (Giegue and Masked Man come to mind), some form of a stage builder, and a really great single-player campaign a la Subspace Emissary. Looking forward to: Getting a chance to try the new characters and returning veterans. Down Special, Dash Attack, Ledge Attack, Side Smash, Forward Ariel..... etc. : Explosion - OHKO's foe but leaves Megumin Prone and unable to move until defeated. I actually made a Mii Fighter of her for Smash 4. Mii Gunner has a lot of explosive special moves. Hey you! Yes you!! You're cool! Wanna know why? 'Cause your part of the #PiranhaGang, right? Your not?! Well come join up and main Piranha Plant when Super Smash Bros. Ultimate releases to be cool like us members of the #PiranhaGang! I'm strangely hyped and really looking forward to playing as him. Leave it to Sakurai to include the one fighter no one could have predicted, and make it actually work well on top of that. Honestly, I haven't played Sonic a lot lately, I will try him in Ultimate, but if I don't like the way he's different, I will move him down to "Like to play"
Welp because I'm sad i have no nintendo/wii/ whatever this is on I only got a ps4. though my friend has a wii with smash bros and my personal favorite character is pikachu. cause i wreak havoc as him.